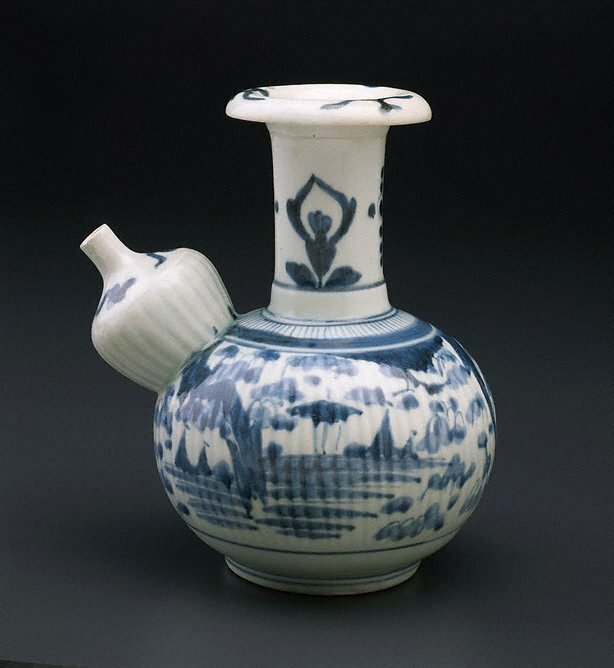 The 'kendi', a drinking water vessel with a spout but no handle, is a form distinct to Southeast Asia, where it has a long history. The name is thought to derive originally from the Sanskrit word 'kundika' meaning a water vessel, and was an attribute of Hindu and Buddhist deities. Made in China as early as the Yuan dynasty, it was also known as a 'gorgolet' (from the Portuguese 'gorgoletta'). The main markets were Indonesia and Malaysia, and Chinese, Japanese and Thai potteries catered to this market, as well as local potteries. The shape became popular in Europe in the 1600s, as evidenced by its frequent appearance in 17th-century Dutch still life paintings.